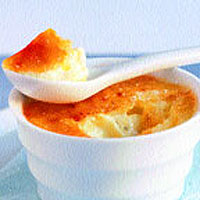 With its thin layer of burnt sugar and smooth, vanilla-flecked custard, crème brûlée is a dish you'll never tire of. Tonia George shares her version of this perennial favourite. There are murmurings that a dish called 'burnt cream' appeared at Trinity College, Cambridge long before it became the ubiquitous dessert on French brasserie menus that it is now. It seems fitting that this dish, which poetically juxtaposes the sharp with the smooth, should have been born in such a literary place, but the name 'Crème Brûlée' beats the prosaic English term by a long way. Preheat the oven to 130°C, gas mark ½. This low heat will ensure the custards stay smooth. Prepare a bain marie by placing a deep roasting tray or ovenproof dish, a third full of warm water, on a low shelf in the oven. To make the custard, pour the double cream and milk into a heavy-based saucepan (I find that custard made with milk is lighter than without). Split the vanilla pod lengthways with a sharp knife and scrape out the beans inside. Add the beans and pod to the pan and heat gently until almost boiling. Add the eggs and vanilla cream and return to a low heat, stirring and scraping the bottom of the pan until it starts to steam and thicken and will coat the back of a spoon. The process of thickening takes a while, and then happens in no time, so remove it from the heat if it is getting too hot. It usually takes about 5-8 minutes, depending on how hot the milk was when added. Don't let it simmer, or you will curdle the eggs. Once it has thickened, take it off the heat and strain it (you can wash and reserve the vanilla pod to use to add flavour to a jar of sugar). Pour into a wide measuring jug, so it is easier to pour into the 6 ramekins. Place in the bain marie and cook for 35-40 minutes. Give them a gentle shake; they should be wobbly but not liquid-looking. Don't press them as they will have formed a skin and you don't want to break that. They will firm up further on cooling. Remove the custards from the bain marie and allow to cool completely. Chill for 3 hours, or overnight. Take them out of the fridge and scatter with a thin layer of sugar (about 1 tbsp sugar per brûlée). Ignite the blowtorch and evenly heat the sugar until deep golden. Serve immediately: if you refrigerate once you have done the tops, the sugar will start to dissolve. A blowtorch is by far the best way to achieve the crunchy topping, but if you don't have one, you can place your crème brûlées under a really hot grill for 3-4 minutes, though you must protect the custards by half filling the bain marie with heavily iced water. The custards will end up more liquid underneath the surface this way, because the heat from the grill melts the set custard. The caramelisation won't be as even, so you will get more black patches, too.